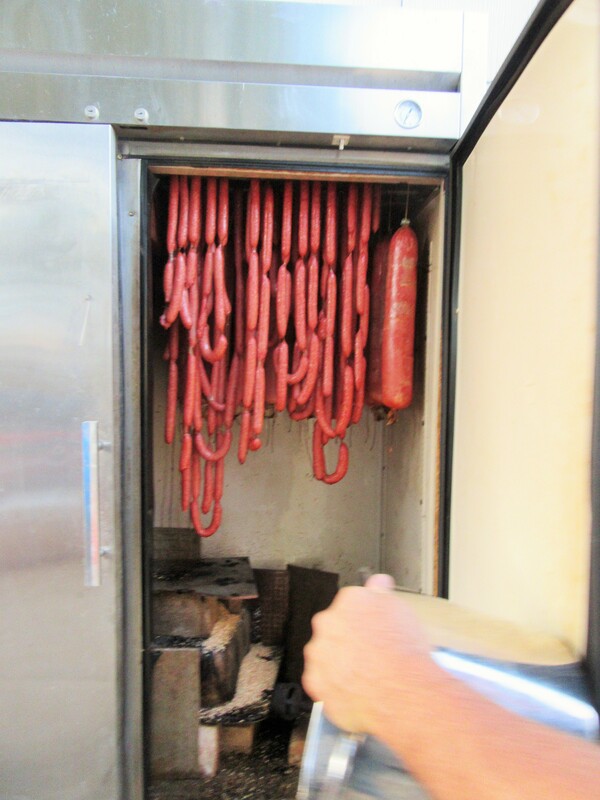 Some of the hotdogs and cotto salami in the two door smoke house. 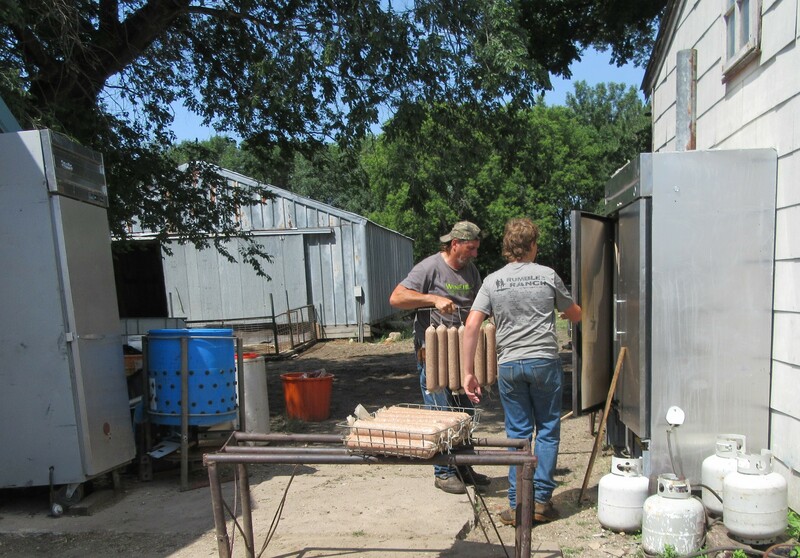 Fred and Mario loading the two door smoker with Cotto salami. On a very hot day we made a bunch of goodies for the summer. In the freezer now are 100#’s Beef and Pork (no MSG) Hotdogs, 75#’s Polish Sausage, 25#’s of Cotto Salami, and 100 #’s of Ham Rolls. 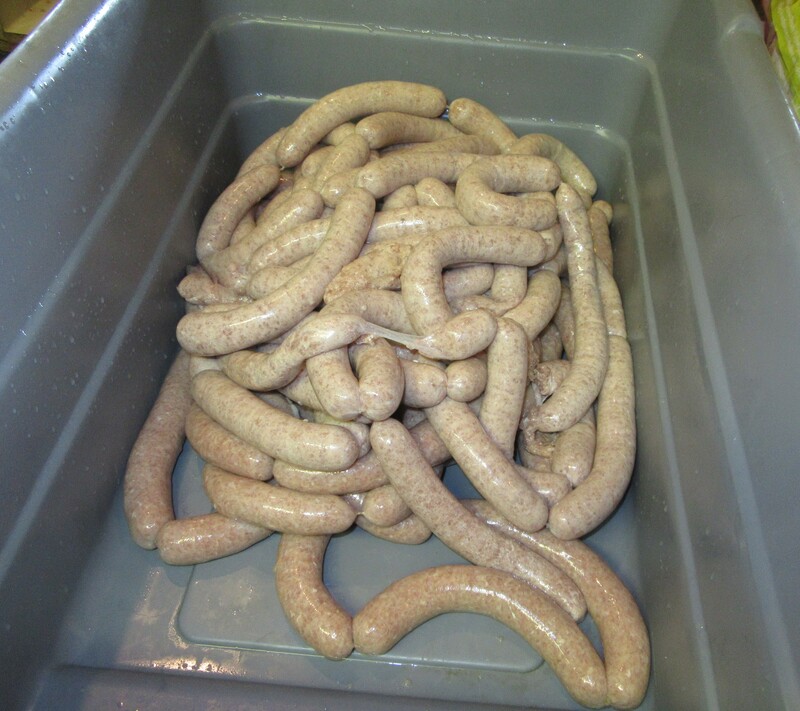 Also in the freezer are 200 #’s of plain sausage, also all of the loins and ribs were packaged and frozen. I have a pack of ribs in my Insta Pot now in spaghetti sauce for supper tonight. Alan Ferber came down again from Milbank, SD to help out with the work. He always is teaching and joking around which makes it more enjoyable. Reece and Vonnie grinding the meat which in this photo was partially frozen. 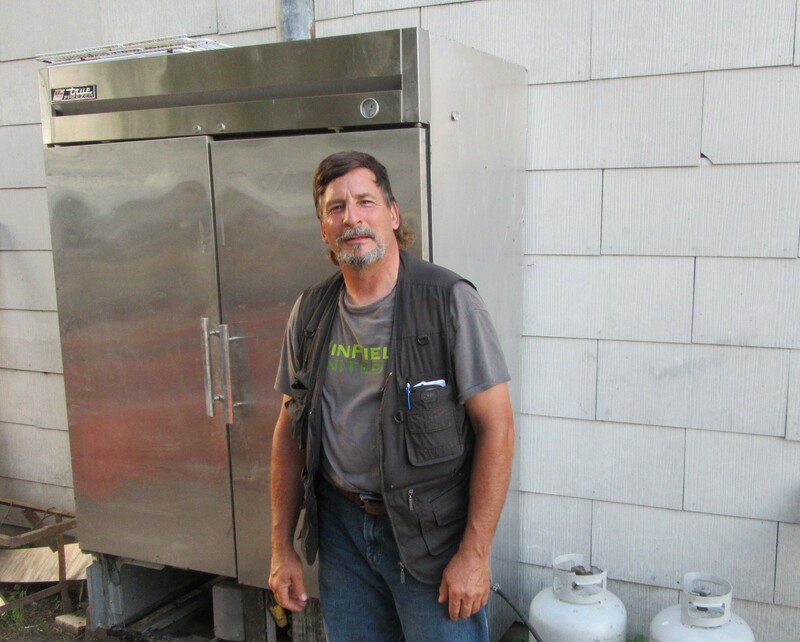 Much of the pork and beef was pre-frozen ahead of time from butchering sows and a steer at a previous date in order to do much of the processing all in one day and not having to mess up the equipment for just one sow here or there. When you are doing this kind of work in the heat, the meat has to be kept cold and then processed very quickly in order to keep the meat from becoming too warm. It must have been fast because we began at around 8:30 wrapping the loins and ribs while the kids finished chores and ate breakfast. 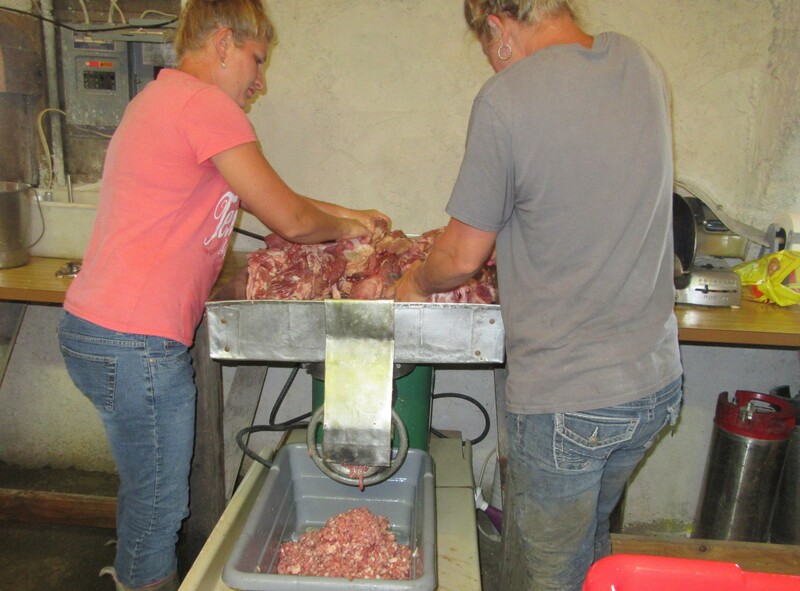 Then around 9:00 the girls started grinding and preparing for the sausage making. A quick lunch of barbeque pulled pork and cheese sandwiches with chips and cinnamon donuts was served as they worked and they were still able to get chores done and make it to the Yellow Medicine Co. Fair that evening. Mario, Fred and Al begin making the hotdogs. Raw hotdogs, not bad for Mario’s first try. Remind me never to complain about the cost of the expensive all-beef hotdogs ever again. It’s a lot of work! Fresh picked apricots!! They are in the juicer as I type. The girls have been making jelly over the past few weeks and have heated the kitchen up quite a bit with the multiple canners going. First they started with mulberry and most recently they’ve made combinations of apricot mixed with peach, orange and strawberry. 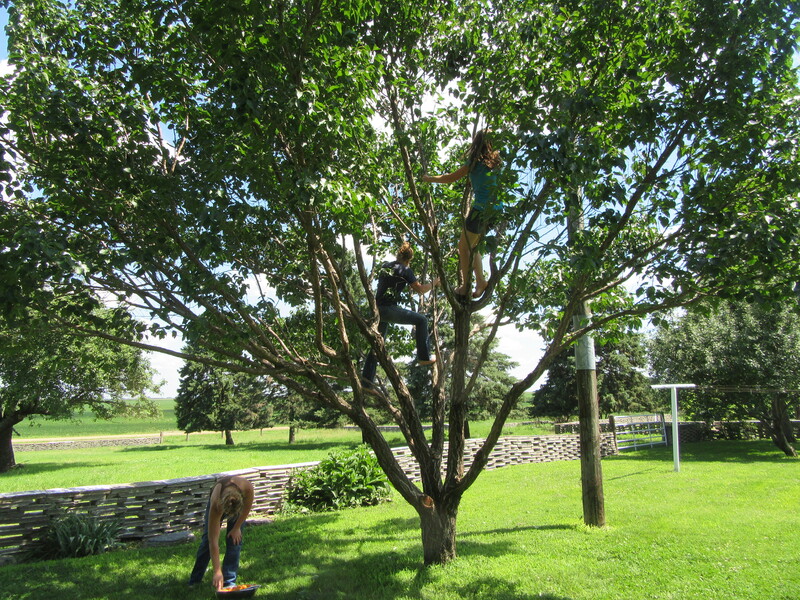 Next in line will be more apricots and then chokecherries, which the kids have gone out to harvest from several trees around the farm. Shake that tree girls! That’s how we harvest Apricots. Ground picking Apricots. Not too bad in the shade! 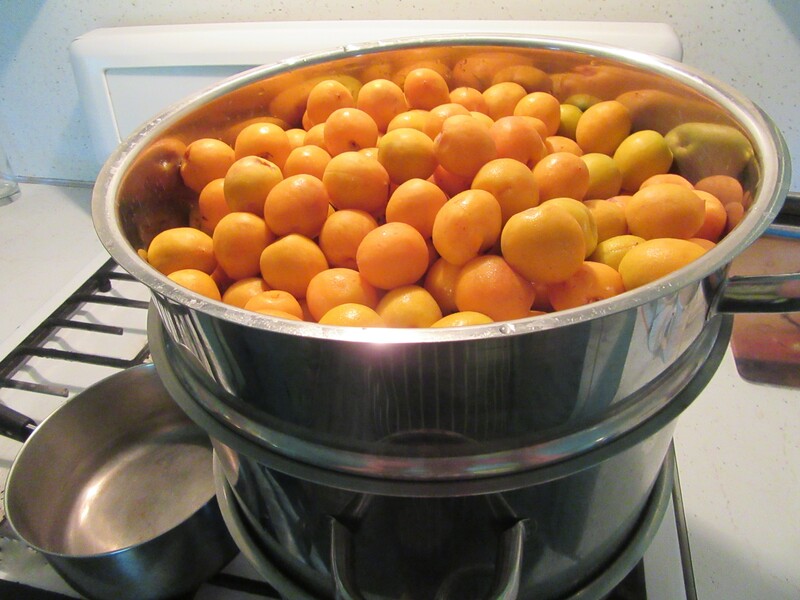 Juicing the fresh apricots for making jelly. 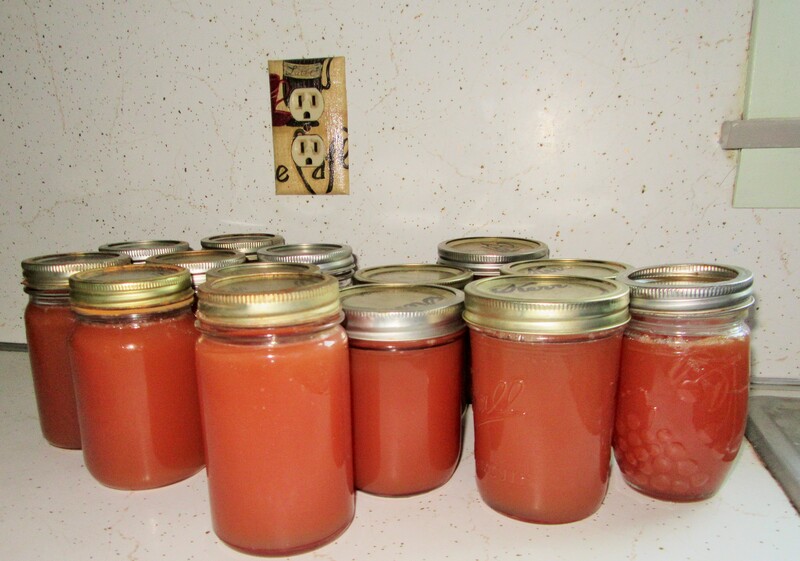 Maggie has started brewing wine out of rhubarb recently and also out of some of the apricots. Yesterday her batch of rhubarb exploded all over the kitchen wall and floor after she added some water to it, but the good news is that she still has half of it left! Those home brews can be awfully touchy! Now she has kindly moved the operation outside! 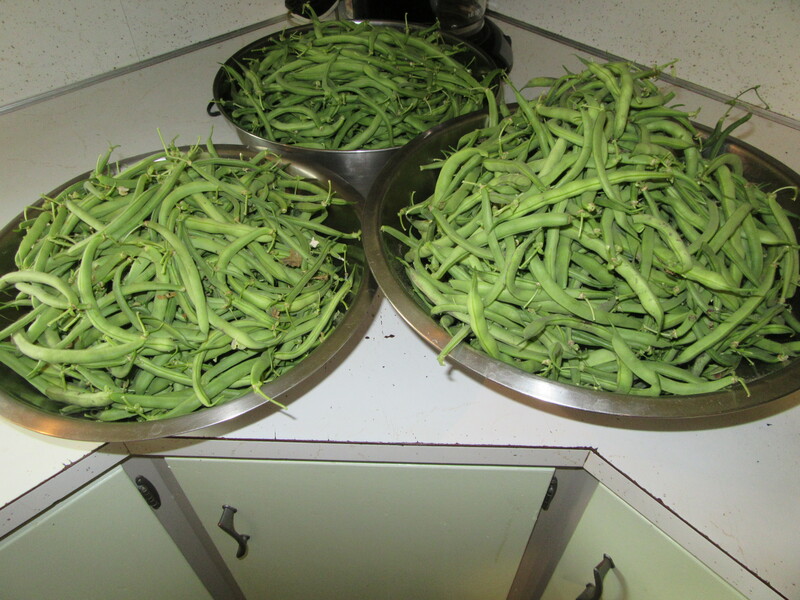 Green beans are coming out of our ears and we are so thankful! 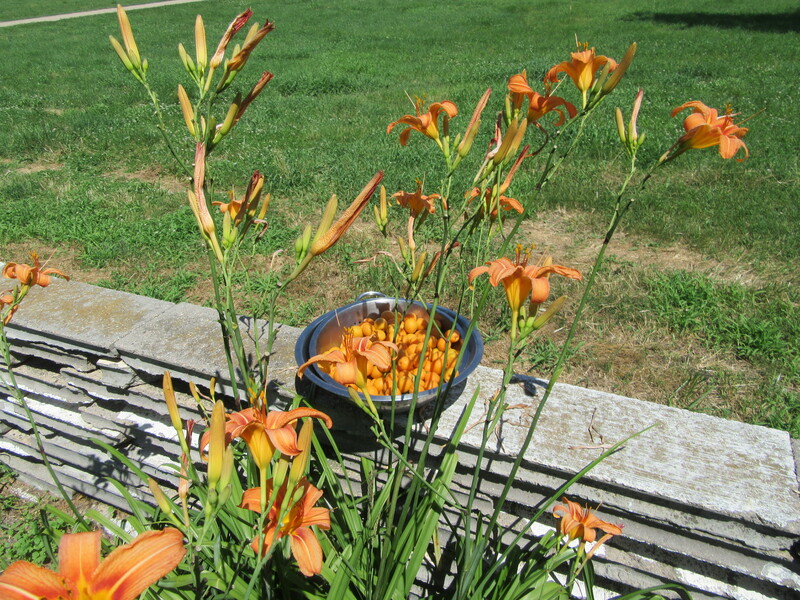 Oddly we have had plenty of rain even in July. Last but not least, Fred, the love of my life!!!! Life is good with this man by my side! 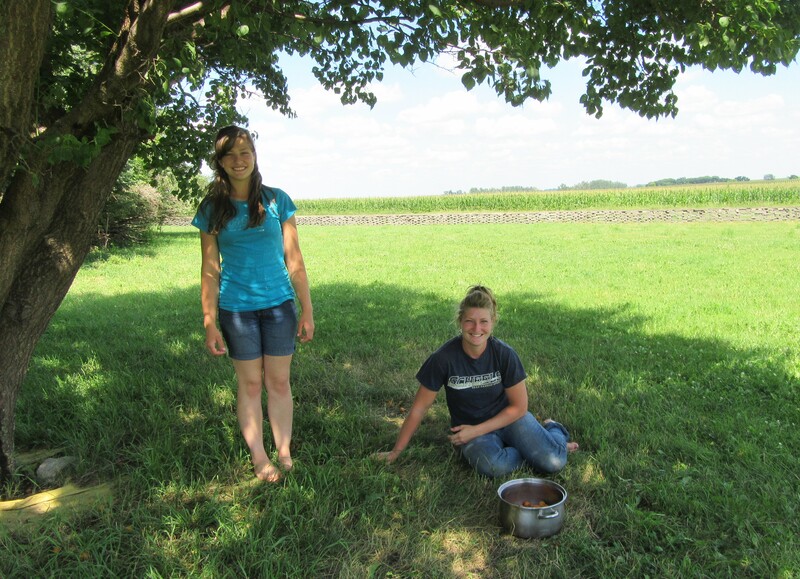 This entry was posted in EVERY DAY FARM LIFE and tagged Callens honey farm, home made hot dogs. Bookmark the permalink.